China has been the largest consuming country for ICs since 2005, but large increases in IC production within China have not immediately followed, according to data presented in the new 500-page 2019 edition of IC Insights’ ‘McClean Report—A Complete Analysis and Forecast of the Integrated Circuit Industry’ (released in January 2019). 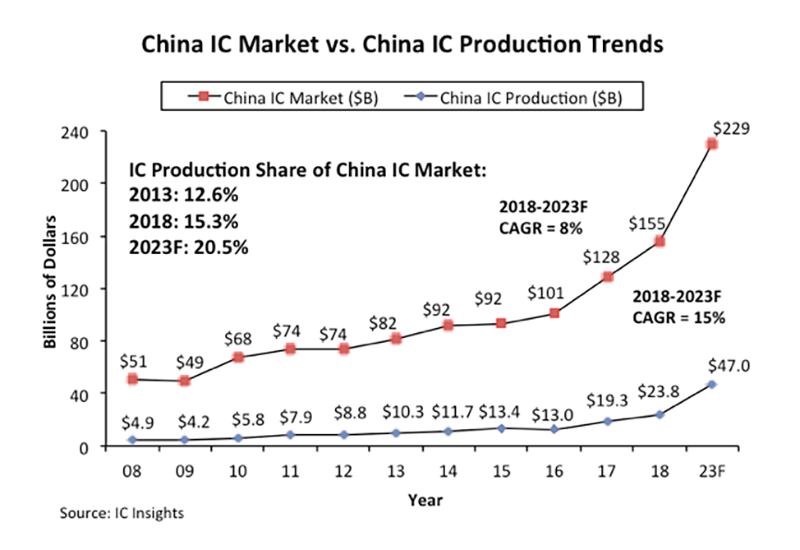 As shown below, IC production in China represented 15.3% of its $155bn IC market in 2018, up from 12.6% five years earlier in 2013. Moreover, IC Insights forecasts that this share will increase by 5.2% points from 2018 to 20.5% in 2023. Currently, China-based IC production is forecast to exhibit a very strong 2018-2023 CAGR of 15%. However, considering that China-based IC production was only $23.8bn in 2018, this growth is starting from a relatively small base. In 2018, SK Hynix, Samsung, Intel, and TSMC were the major foreign IC manufacturers that had significant IC production in China. In fact, SK Hynix’s 300mm China fab had the most installed capacity of any of its fabs in 2018 at 200,000 wafers per month (full capacity). In early 2012, Samsung gained approval from the South Korean government to construct a 300mm IC fabrication facility to produce NAND flash memory in in Xian, China. Samsung started construction of the fab in September of 2012 and production began in 2Q14. The company invested $2.3bn in the first phase of the fab with $7.0bn budgeted in total. This facility was the primary fab for 3D NAND production for Samsung in 2017 with an installed capacity of 100,000 wafers per month as of December 2018 (the company plans to expand this facility to 200,000 wafers per month). Significant increases in IC sales over the next five years are also expected from existing indigenous Chinese companies including pure-play foundries SMIC and Huahong Group and memory startups YMTC and ChangXin Memory Technologies (CXMT, formerly Innotron). DRAM startup JHICC is currently on hold pending the sanctions imposed on the company by the US. Moreover, there are likely to be new companies looking to establish IC production in China like Taiwan-based Foxconn, which announced in December of 2018 that it intended to build a $9.0bn fab in China to offer foundry services as well as produce TV chipsets and image sensors. If China-based IC production rises to $47.0bn in 2023 as IC Insights forecasts, it would still represent only 8.2% of the total forecasted 2023 worldwide IC market of $571.4bn. Even after adding a significant ‘markup’ to some of the Chinese producers’ IC sales figures (since many of the Chinese IC producers are foundries that sell their ICs to companies that re-sell these products to the electronic system producers), China-based IC production would still likely represent only about ten percent of the global IC market in 2023. Given the sheer size of China’s investment plans over the next five years, it is likely that China will achieve some level of success with their strategy to become less reliant on IC imports. However, given increased government scrutiny of Chinese attempts at purchasing foreign technology companies and the legal challenges that the Chinese startups are likely to face in the future, IC Insights believes that China’s current strategy with regard to the IC industry will fall far short of the level of success that China’s government has targeted with its ‘Made in China 2025’ plan (i.e., 40% self-sufficiency by 2020 and 70% by 2025).